SMW has been fabricating and coating Heavy PL, Tanks, Structural Steel and Other Metals for more than 20 years. Our highly skilled staff of experienced welders, fitters, shop personnel, and office staff take much pride in the products we produce. Looking at fabricating a large project? Let SMW take a look! 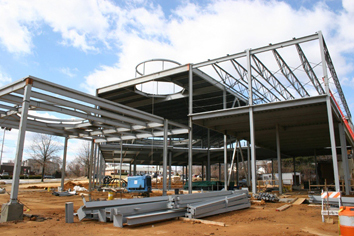 We have successfully provided the structural framing on a multitude of large projects. We work with some of the best raw materials in the business to get the right dimensions the first time. Our team of experienced fitters will make sure your decorative or hidden rolled material looks and fits the way the architect envisioned it. Have some Handrails or Ladders you need fabricated? SMW ladders can be manufactured of many fashions including caged and non-caged. Welded, tacked, jam-nutted. Whatever your requirement, we can supply ready install at the job site. Have a complex welding job that needs done right the first time? Put our welders to work for you and your project. No project is to complex. From concept to completion, SMW customers have come to know we have control of the whole process. When a wind power generation company envisioned a new, streamlined design for their turbine towers, they contacted us. We were able to take their concept, produce detailed drawings, fabricate custom components, construct the entire assembly, finish, and then ship it to the installation site. Every aspect was under our control. Here at SMW, no project is too big. Find out more by clicking the button below. Your project's success starts with precise fabrication. At SMW we have all the components to bring your concepts to completion. Let's face it, there are many fabrication shops available doing what we do. When it comes right down to it what makes the difference? At SMW we believe in zero-tolerance-for-error construction practices. We do exact construction, matching the drawing specs exactly and with precision. Our company has all the equipment to fabricate it right the first time. When it leaves our facility, you can believe its ready to go. Take a look at some of the past projects we have completed by clicking The Gallery button below. You'll know why SMW should be your choice for your next project. Experience: SMW has been in existence for more than twenty years, but our industry experience spans almost half a century! Custom Solutions: With our team's experience, ambition, and problem solving skills, there is nothing we can't do. What search engine do you use most? We do all our fabrication in house and are a true fabrication shop, not just a shop that assembles other vendors’ products. We control our own destiny this way and it allows us to maintain the quality control your project deserves. From one piece to several hundred tons; SMW employs some of the latest technology, staff, and experience to get your project done on time, with less stress and in a more cost effective manner than others in the industry.